Today’s Botany Photo of the Day comes courtesy of dinesh_valke@Flickr (original image). Take a look at his set of additional excellent photos of Bombax ceiba! Common names for Bombax ceiba, a member of the Malvaceae (also placed in the Bombacaceae), include Indian kapok, the red cottontree, and the simal tree. As dinesh_valke notes in the written accompaniment to his Flickr photo, the fruit of the simal tree produces a silk-like floss often used in pillows, cushions, and blankets. Bombax ceiba is native to tropical Asia, temperate Asia, and parts of Australia. The trunk and stems of young trees are covered in sharp outgrowths to deter herbivores. I found sources claiming these are spines while others claimed prickles (see here for a clarification) — there is a difference! The mature trees often have wide buttresses for support. Flowering occurs between March and April for three weeks and fruit is produced quite rapidly in a period of one month. The bisexual flowers require outcrossing for successful fertilization. Flowers of Bombax ceiba illustrate a few floral innovations required for specialized pollination. 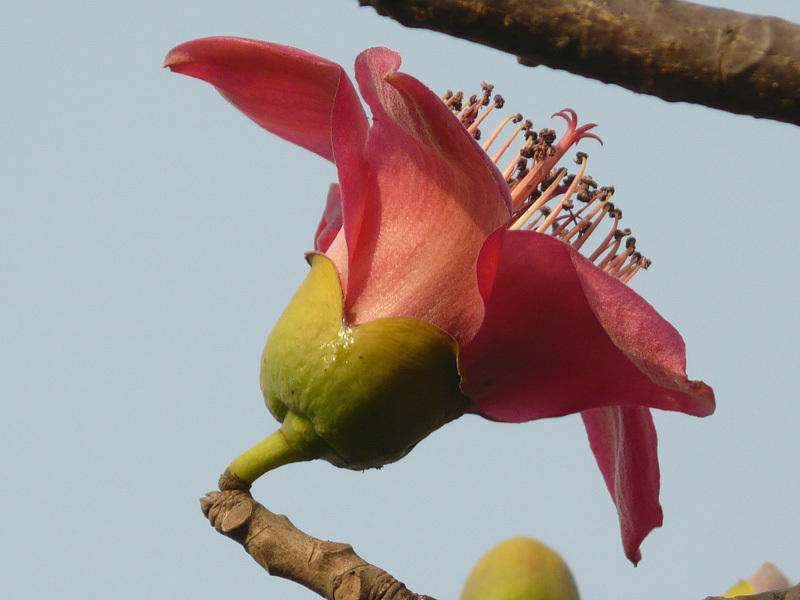 Raju et al., in Bat and Bird Pollination in Bombax ceiba (PDF), found that mature buds open at night, releasing a somewhat rancid odour. They are bright red, held upright on the tips of strong branches, and produce copious amounts of nectar. As noted, this pollination syndrome is indicative of two pollinators: birds and bats. Among the many visitors to the tree (including bees, squirrels, and monkeys), Raju et al. observed that only bats and birds were pollinating the flowers. Many of the other animals were found to be detrimental to the pollination process, through florivory (flower consumption). The worst offenders, as seen in a picture from the article, were monkeys who would consume the nectar and half the flower, then nonchalantly toss the flower to the ground. Great feeling; many thanks to UBC !!! The Campbell magnolia of tropical gardens. Hooray for the Malvaceae!! I have run across Bombax ceiba in Genbank several times when looking for Malvaceae sequences but never knew what it looked like. Thanks! As to the spines vs. prickles question, just based on dinesh_valke’s photos, I’d say they are prickles, as they seem to be randomly distributed – sometimes appearing singly, others in tight group – much like a rose’s prickles. I want complete details of simal tree,its crop in india,its avalability,history,usage etc. with photographs. Beautiful photo. I have just visited Macau and the adjacent city in China, Zhuhai, and was bewitched by the flowering trees I now know are Bombax Ceiba. I stopped our taxi to photograph them where the flowers were closer to the ground and took a good shot of looking into a single flower. The trees in avenues look quite wonderful, with the pale green leaves begining to unfurl. The Zhuhai city authorities are to be warmly commended for using this tree so plentifully in their street plantings. Our taxi driver, who was quite a learned gentleman, told us it was the wood cotton tree, that its fibre was too sparse for use as stuffing material, but that the flowers were sometimes used in teas…all of which information I have confirmed on the internet. I have this tree in my back yard and I want to know more about it! The flowers were such a mess and stank very bad when they fell! Now I have what looks like a fruit falling from it! I looked it up and it says something about cotten but I would like to know way more! The Leppun as it’s known in Burma abounds in the area around Mandalay and Amarapura. I have happy childhood memories of many a trip we made headed by our grandmother, the matriarch of the extended family, a whole bunch of us kids and grownups to harvest the windfalls each summer in March-April. You never pick them from the trees. They are impressive tall trees with very little foliage when in full bloom with flaming red flowers, and still line the east bank of the Irrawaddy between Mandalay and Sagaing. The flowers are used to flavour soup; a bit tangy and one of our favourite sour soups. You can eat the flowers of course.They may also be dried in the sun for later use but the flower gets quite chewy. We used to play a game with the stamens. It’s a fight like grappling irons and the one that decapitates the other is the winner. Great fun.